You've heard of those recipes that hide veggies in typical kid fare? The kids (in theory) enjoy their mac and cheese, never knowing they're getting a dose of cauliflower along with the cheese and noodles. Maybe, just maybe, those creative moms are on to something. If you've ever wanted to give your child a financial lesson without seeming like a droning nag, why not take the same sneaky vegetable concept and sneak in a lesson this Christmas season? It's almost a given that your children will receive money from somewhere as a holiday gift. Why not take a bit of time and turn that gift money into an opportunity to talk finances with your child? First off, I don't expect you to come out and say: "Children, gather 'round my chair to hear a fascinating lesson on finances." That will probably not do the trick and will likely send them into eye-rolling fits of childhood angst. What you can do is, casually, ask to see what your children got for Christmas and who got it for them. You already know Aunt Sally from Cleveland sent each niece $25, but it might be a good place to start when you want to sneak in some money lessons. 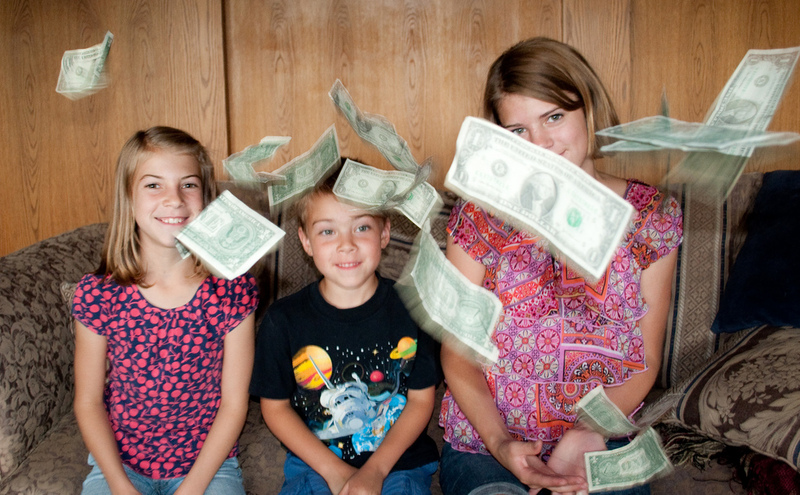 When you've got the scoop from the kids on how much they actually raked in for Christmas, find out what their plans are concerning the moolah. Was there something on their wish list that didn't get crossed off? Are they craving comic books and candy? Take a minute to focus in on what your kids have in their mind. And then what, tell them how to spend it? Or better yet, how not to spend it? In a perfect world, maybe. In the real world, no. The money was, after all, gifted directly to the kids; it really is theirs to use in any way they desire. However, you are still the parent, and can influence and guide decisions made by the tween purse string holder. In fact, even though it seems most kids crave instant satisfaction and would be (temporarily) happy with a full-out spending frenzy that would put your holiday shopping efforts to shame, they might just welcome a bit of parental guidance, especially if it's presented in a casual manner that flows with an everyday conversation. So, after you've shown appropriate excitement over what your kids have received for Christmas, and after you've heard their plan of attack for spending it, you can then throw out a few suggestions of your own on what to do with the money. Of course, the two biggies to possibly suggest would be saving and giving. If you've not talked with your child about saving for a rainy day, now may be the perfect time to start, especially if your child receives some sort of regular allowance. Say your son has his eye on a pretty expensive video game, but he's also wild with the thought of snatching up a ton of comic books. You might give him the idea that if he saves at least a portion of his Christmas money now while reducing his spending on comic books (but not totally forgoing buying them), and he sets aside a portion of his allowance, in time he'll have saved enough for the game. You can help him focus his eye on the long-term prize, and in turn, help him think about wisely spending the money not saved since there is less of it to spend. It seems that giving is on most people's minds more during the holidays than any other time of the year. You can use this natural tendency to educate and encourage your children regarding giving of their finances. Children do tend to be self-centered, at least to a certain degree. Christmas is a great time to point out how some people, even other children, often have less and may go without certain things. After you and your son are done picking out and buying comics, why not use the bucket-and-bell-ringer combo found outside the store to start a simple conversation about giving to those in need. If sneaking is good enough for something so important as good nutrition, why not borrow the approach for something that is as life-long important as finances. With a few well-placed questions and conversations, you can easily sneak in a few lessons that will continue to reap benefits throughout your child's life. I am definitely doing this with my kids when I have them. Great ideas. I love the picture too. This is a great idea! Another good gift idea that can also teach kids about money is purchasing them 1 share of stock that they would be interested in (think Mattel, Apple, Disney, etc).